How often do you walk into an art exhibit and your breathing just … stops? So it was, a couple weeks ago when I finally managed to fit a visit to this show into my typical Saturday-in-Minneapolis morning. 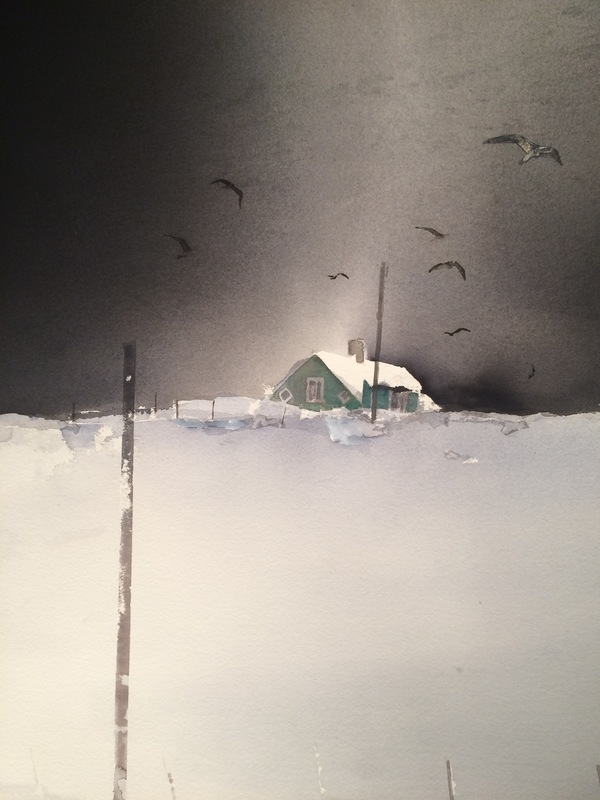 “The Watercolor Worlds of Lars Lerin” was about to finish its run at The American Swedish Institute and I was determined to check it out, even if my plans on the way there included a 10-mile run, a yoga class, and a change of clothes, but no intervening shower. I knew nothing about Mr. Lerin and don’t have any particular attachment to the watercolor medium. However, every show I’ve seen at ASI has been excellent, I had read that birds are featured in several of the works (ornithology is a growing interest for me), and special Lenten Swedish treats were available at the museum’s attached restaurant, FIKA. Lent was about to end; cardamom and sugar taunted me. 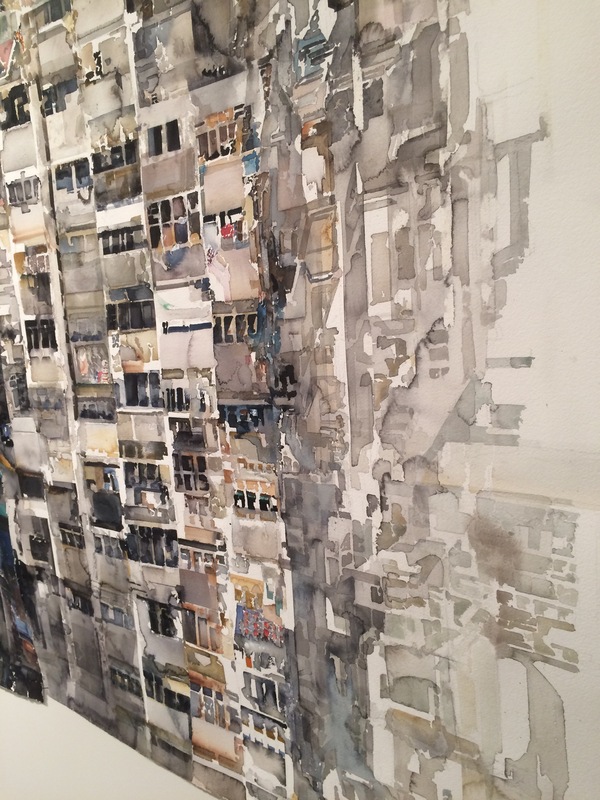 Two things struck me as I took a few steps into the exhibit: scale and intensity. Most of the works were huge – well over four by four feet, and some filled entire walls! Large scale allows paintings to be more like sculpture to me: more immersive and rewarding from up close and also from far away. I’ve rarely seen watercolor paintings that covered such a range of darker shades: I don’t think there was much water in this watercolor. It was a surprise to achieve such success with light play in this medium, and also such fine detail. 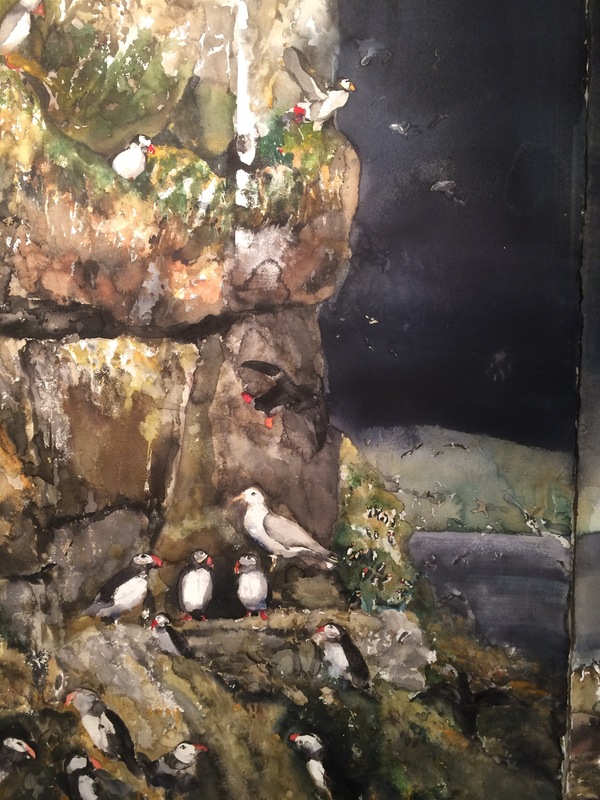 The photo at the start of this post is a small portion, maybe about 1/4 of the full painting, of a shoreline scene showing a variety of birds, mostly puffins. The castle (Turnblad Mansion) that is ASI’s primary housing was a perfect location for this show, as the large windows and very detailed, reflective surfaces (carved wood and brightly-painted kakelugns are in most rooms) therein added plenty of light as well as some cultural context to these pictures of nature, and of culture juxtaposed with nature. I really did need to remind myself to breathe a few times, while spending an hour or two enjoying this show. What a delight! "Do Semlor travel well?" (Aye, they do and the cute box kept me from eating them yesterday). Thanks, FIKA at @amswedinstitute for this yummy Easter breakfast! A few nights ago we cooked a delicious meal of mahi mahi with a vanilla-mango sauce. The tangy-sweet flavor in a main dish reminded us of some of the foods we enjoyed in our SE Asia trip, two years ago. So does this Creamy Turmeric Smoothie. Add some Greek yogurt! Tasty. This tasted nothing like Asia but it was similarly different and sweet: Tagliatelle with Caramelized Oranges and Almonds. It was part of our Easter dinner, along with some rotisserie chicken and a salad. It was featured on a recent episode of Splendid Table in which Lynne and Josh Bell together prepared a dish that may have been contemporary with some of the composers whose works he performs. It could be served as dessert (the recipe incorporates 2/3 cup of sugar! ), at least if the meal didn’t already fill your guests up on some other form of simple sugar. On the same evening, we watched Cloud Atlas on DVD. It’s a pretty high-concept movie, in a good way! A sort of melding of karma, apocalyptic imagining, and open-heartedness. I enjoyed the story, costuming work, and one of the Tom Hanks characters was particularly amusing. And to think, I was wondering what Tom Tykwer was up to, lately! I’d like to read the David Mitchell book, now as I’ve heard the sequencing may be a little different, and I’m curious about how it handles the continuity of characters/souls, so to speak. I’m still thinking about this film! Steve had some fun tinkering with technology with Al, last evening to help make a mostly self-running greenhouse. Read about it here! I’ve got a month and a half to go before my 25k trail race up on the North Shore (of Lake Superior). Training goes well; my long trail runs are up to 18k /2.5 hours. Yesterday I ran in some new Saucony Peregrine 6 shoes (thanks for the 20% off coupon, REI! ): I love my Hokah Challenger trail shoes, but am apprehensive about using such stilts on the rugged Superior single track trails of the race. I’m happy to report that my feet and body felt good during the run and also today! Plus: argyle laces. ARGYLE LACES! And they stay tied.